A fascinating insight into the location where the ‘Rosetta Stone’ was discovered till this day, is still a mystery as to how it got there. A small City known as ‘Rashid’ in the north of Egypt. You will be collected from your Hotel or cruise ship (at exit point of cruise) at around 08.00 am by our Memphis Tours expert English speaking Tour Guide and transferred in an air conditioned modern vehicle (including bottled water) and driven about 1 hour by road from Alexandria to the City of Rosetta, now known as Rashid. On arrival, you will be taken to the Rashid Museum which is one of the original unique styled red and black brick houses within the City’s small winding streets. A full tour of the Museum with your Guide to discover a replica of the Rosetta Stone inscribed in 3 languages, Ancient Pharaonic, Demotic, and Ancient Greek (the original currently on display in the British Museum). From here, we will take a walking tour around the small local streets and Souq to discover the local life and markets selling their fresh produce of breads, fruit and vegetables, fish and meats whilst heading to the preserved Ottoman Homes. Moving on to discover a second House within the City’s streets and other old house frontages. The House of Amasyali is of a very ornate nature and considered one of the finer examples. A further visit to the Mill of Abu Shaheen which will uncover a house for trade serving the household and the local community. After your tour of the Houses, you will walk a short distance with your Guide to visit the local ‘Hanging Mosque’, a unique construction and is one of only a few Mosques in Egypt built on an upper level in order to have storage units underneath for shops and supplies. Finally, you will take a short drive to the Citadel on the outskirts of the City. built around 1479 and lying next to the Nile river with views of the Mediterranean sea. Known as Qaitbey, it was built as a defence mechanism to guard against attacks by invaders from the Mediterranean. Take some time to climb to the top of the Citadel along the fortified walls to see the lovely views of where the NIle meets the Mediterranean. 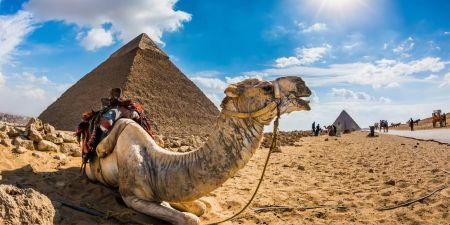 You will then leave the Citadel and head back towards Alexandria with a stop off for lunch and time to relax before returning to your Cruise or Hotel in Alexandria.